Meow! : Father's Day at Meow! You wouldn't think Meow! --being a women's clothing store-- would have much in the way of gifts for Father's Day, and you'd generally be right. But one thing we do have is cufflinks. Cufflinks are the perfect gift for dad, even if he doesn't have any shirts with French cuffs. Cufflinks say, "you're a classy guy who deserves this symbol of masculinity" like almost no other gift. Meow! always has an assortment of cufflinks (and even the occasional matching tie pin or clip!) 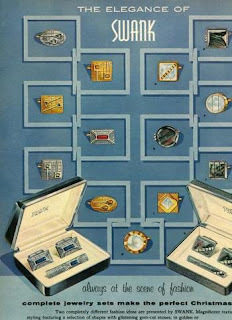 so take a look in one of our jewelry cases for that special fella in your life. Prices range from $10 to $20. Other gift ideas: classic LPs with Frank Sinatra, Rolling Stones, etc, hats, ties.